If you lived in an alligator-infested swamp and had to send your children to school way up in the trees, what features would you look for in such a tree school to make sure it was structurally stable and safe from the gators below? Would you want the school to have a bridge or a ladder or maybe a helicopter to deliver the children and teachers to the classrooms? Would it have support beams or security doors? How about an alligator slapper? What would students do for fun? Would their tree school have a pool, a marshmallow maker, a pet room or an indoor playground? These are among the creative solutions that second graders at Coman Hill Elementary School came up with as part of the Tree School Project, which called upon them to work together to design a tree school of their own. Working in groups of three or four in the Technology Library Center over an eight-week period, students used engineering design steps to brainstorm, plan and conceive a tree school. They learned about architects and studied how treehouses are built. This enrichment project, new this year at Coman Hill, highlights the use of problem-based learning, an approach that involves students studying a subject and working together to solve a real problem. As they devised a school and drew their plans on paper with a cutaway view to reveal what was inside, students were practicing the important 21st-century skills and ideas of collaboration, communication, critical thinking and problem solving, creativity and innovation, and community. They also had fun while they designed their school in the sky. The skills on display during the project also transfer to the rest of students’ lives - in the classroom, at recess and at home with family, Ms. Crupi said. The project, which also incorporated the new Next Generation Science Standards, was conceived and taught by Rekha Singh, the building technology coordinator, and library media specialist, Jane del Villar, who guided the students through the background work and planning. 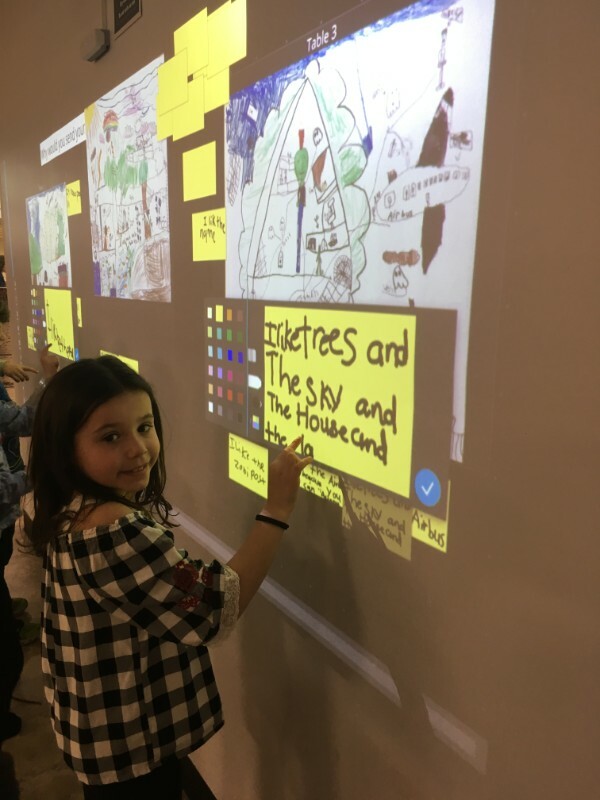 At the conclusion of the project, students presented their designs to their classmates, who left feedback by writing on virtual sticky notes on an interactive digital board that displayed the drawings of the schools. The students were asked to pick a school they would send their children to and leave a comment explaining their choice. “Leaving this kind of feedback is a great way to get students to reflect on their work,” Mrs. del Villar said. Students had fun and learned about teamwork. One group of second graders presents the details of their tree school to classmates in the TLC. A student leaves feedback on a tree school designed by classmates by writing a virtual sticky note on an interactive digital board in the TLC.